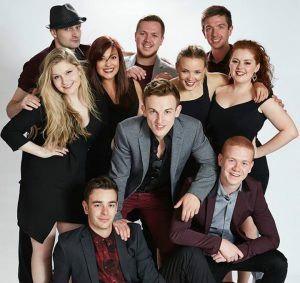 Choral Stimulation multi-award winning a cappella group based in Glasgow. This group performs for receptions, parties, weddings and corporate events.Aptly described as ‘a drinking group with a serious singing problem!’ They are a tight knit group of friends that love singing and making people smile with harmonious, jazzy pop covers, incredible solo voices and funky vocal sound effects! Choral Stimulation is a well- established group, with experience of intimate and international platforms. They have headlined the main stage at the Formula 1 Grand Prix Final in Abu Dhabi, been the Official BBC1 New Year’s Eve Midnight Entertainment, supported The Blanks (Ted’s Band from Hit TV Show ‘Scrubs’) on their European debut, performed at The House of Lords, won lots of awards for performance & production, helped raise hundreds of pounds for charity, beaten 400+ choirs to become finalists in BBC TV Show The Naked Choir, and will soon battle it out on Sky One’s Hottest New Music Show “Sing: Ultimate A Cappella”.